Milton Keynes will have to settle for second place in Four Counties Division 1 after tieing their final game of the season with Elstow. MK went into the game with third placed Elstow knowing they would need maximum points and for Thurleigh to lose their final two games of the season to claim the crown, and they got off to a good start. Nimesh Chavda and Nick Hillman got the ball rolling, putting on 59 for the opening wicket before Chadva fell for 24. Hillman then formed a good partnership with Sam Hagger (39) and indeed Neil Gordon (27) before eventually falling for 87, just 13 shy of his century. His runs though helped the visitors reach 238-7. Elstow's reply read similar to MK's though as Greg Turnbull (78) fired the majority of the runs, while ably backed up by the top five who all scored in the 20s. But despite the best efforts of MK's bowlers, they couldn't take the decisive wickets, and the match ended in a tie. It means Thurleigh (124-2) claim the crown with a game to spare, having wrapped up victory against relegated Printers (121). The battle for fourth place took another twist as North Crawley lost to New Bradwell, and Eaton Bray beat MK City to give last season's champions the spot with a week to go. Chris Timms fired 122 at the top of the order for New Bradwell, and Kieran Lampard fired 58 in their 102-run partnership as the hosts settled on 266-6. And though North Crawley opener Matt Goss hit 55, a superb spell from David Little saw him claim 5-29 to reduce the visitors for 203. Meanwhile Andrew Norris was the key protagonist for MK City (96), hitting 66 and claiming 4-42 as Eaton Bray (214-6). New City are all but safe from the drop to Division 2 despite Biddenham's victory over them on Saturday. 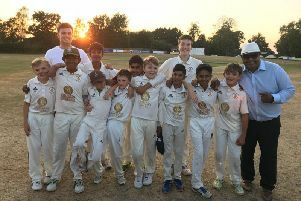 Four wickets apiece to Vaib Tyagi and Viral Shah reduced Biddenham for 202, but despite getting close to the total, City came up just shy of taking the win, bowled out for 199. City sit 22 points clear of Biddenham with a game remaining and should be safe.